I missed out on the preparation but picked his brain for the recipe. It’s not entirely paleo/primal so if you’re a strict follower, substitute where necessary. Grind the meats together thoroughly with a meat grinder. Brown the meat on the stove, remove to crock pot. While the meat is browning, mix together the chili garlic paste, salsa, beef broth, and bbq sauce. Use mixture to deglaze the pan after removing the meat. Simmer for about 2 minutes then add to crock pot. Add coffee, chili powder, onion, bell pepper, corn meal, and ranch beans to crock pot. Mix well. Zest the lemon into the crock pot and cut in half and squeeze out all juice into crock pot. Mix well. Add some salt and pepper, as desired. Let cook on high for 3-5 hours, or low for longer. 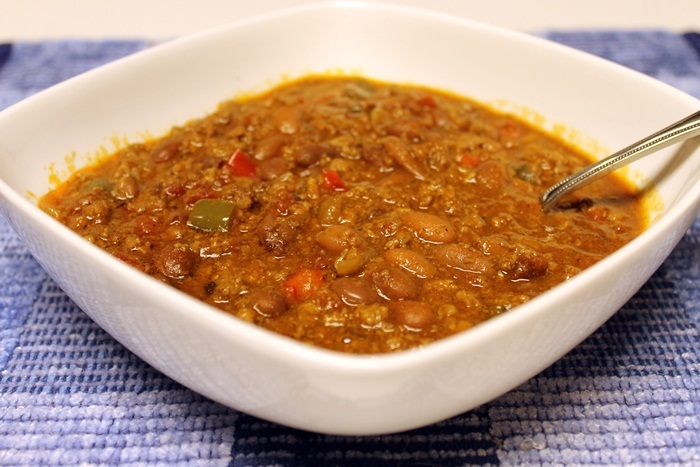 Next to jazz music, there is nothing that lifts the spirit and strengthens the soul more than a good bowl of chili.